Find affordable adventures with great rates on boats and vehicles. With our SwiftLoan* same-day closing, you can get a head start! 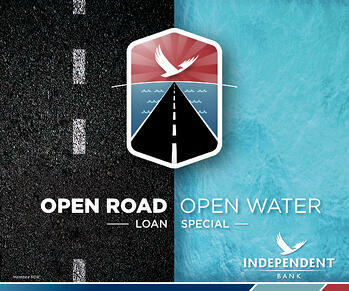 Visit a local Independent Bank branch or call 800.285.3111 for more information or to apply. Loan special begins February 1 and ends March 31, 2019. +The 3.69% APR is based on a $35,000 60-month collateralized installment loan with a monthly payment of $639.73. Other promotional rates apply for terms up to 180 months. Please consult with a lender for details. $175 processing fee applies. Eligibility for promotional rate requires auto pay from an Independent Bank account. Borrowers and collateral must meet standard qualification criteria. Borrower minimum credit score of 700. Loans greater than $50,000 will be .25% higher in rate. Only new Independent Bank loans are eligible for promotional rate. Does not include loans to fund post-secondary educational expenses or those secured by real estate. Member FDIC. Promotion begins February 1 and ends March 31, 2019. *Same-day closing does not apply to loans for post-secondary educational expenses or those secured by real estate. Completed application must be received by 2:00 PM (ET).